The Washington Monument is one of the most recognized landmarks in Washington, D.C. This image was taken by David Iliff on January 12, 2006. It is courtesy of Wikimedia Commons. The monument was constructed in memory of the first President of the United States, George Washington. 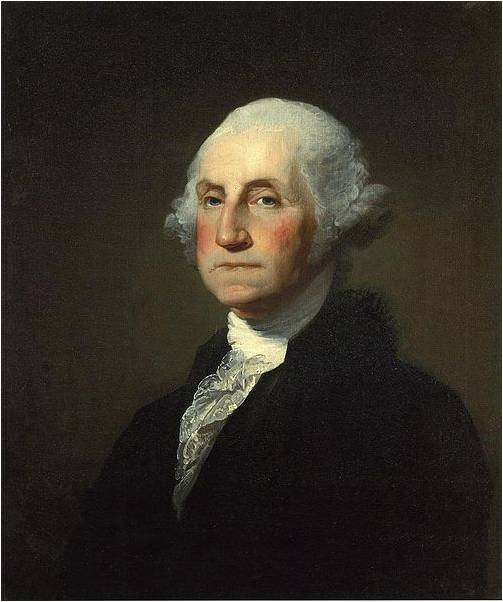 This portrait of George Washington (1732-1799) was started by Gilbert Stuart and was finished by Charles Willson Peale on March 20, 1797. It is courtesy of Wikimedia Commons. 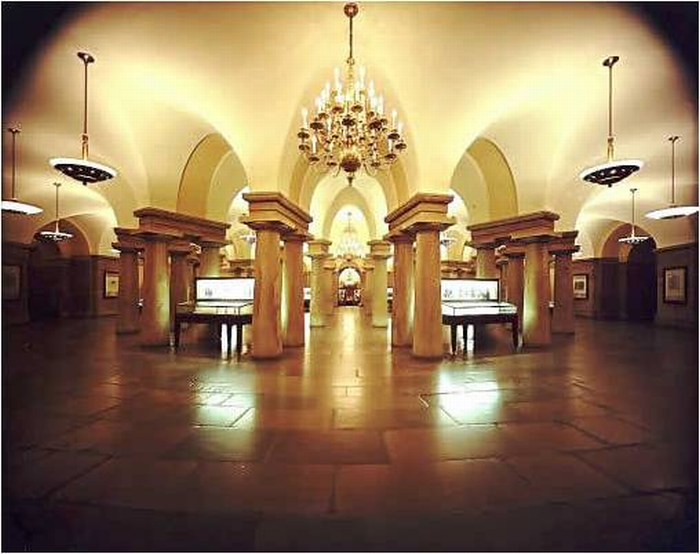 The first memorial to Washington was to be a tomb in the bottom of the Capitol, an area still known as the Crypt. This large circular area is known as the Crypt. The 40 Doric columns support the floor of the Rotunda. Washington was to be buried in the center of the columns. Instead of a plaque for Washington there is now a star in the center of the floor showing this is the point from which all the streets in Washington are laid out and numbered. 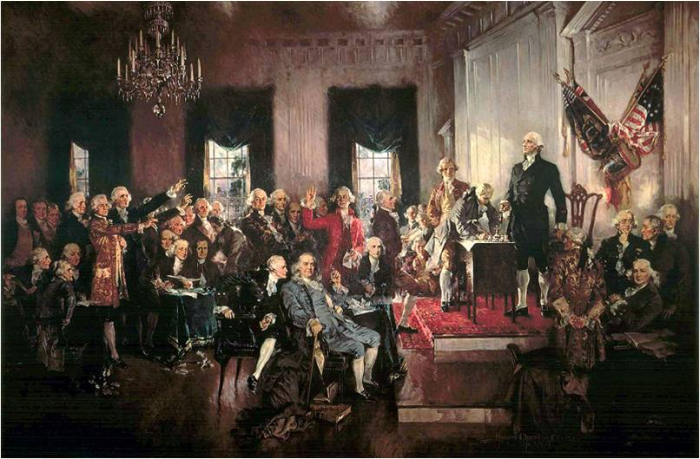 This image is courtesy of the Architect of the Capitol. 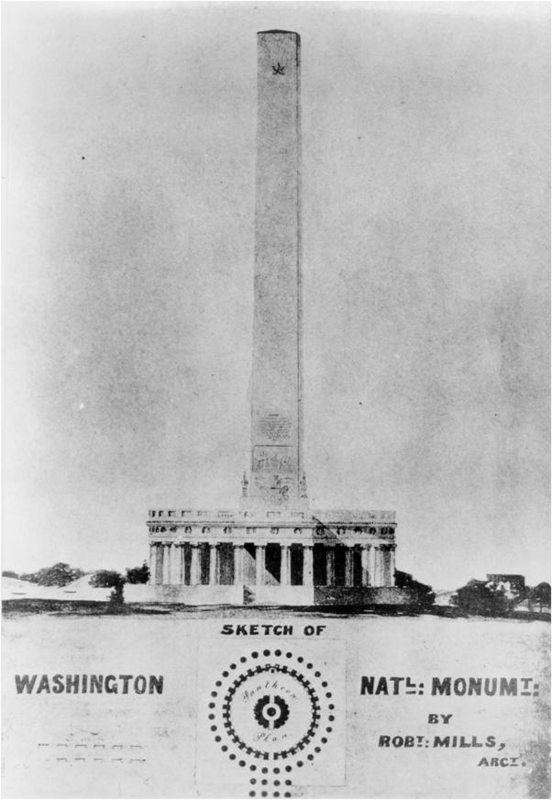 Because of a lack of funds, disagreement over the design of the Capitol memorial, and the Washington family’s reluctance to move the body, a memorial was not placed at the Capitol. 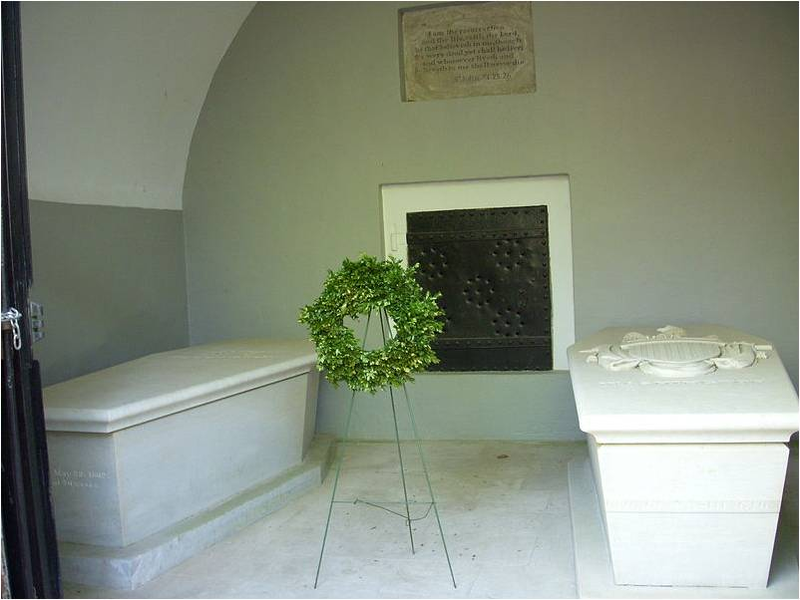 George Washington on the right, and his wife Martha, on the left, are still buried in the family tomb at their home, Mount Vernon, Virginia. This image was taken by Harald Klinke on October 10, 2005. It is courtesy of Wikimedia Commons. In 1832, the 100th Anniversary of Washington’s birth, concerned citizens formed the Washington Monument Society. In 1836 after raising $28,000 in donations, they announced a competition for the design of the memorial. 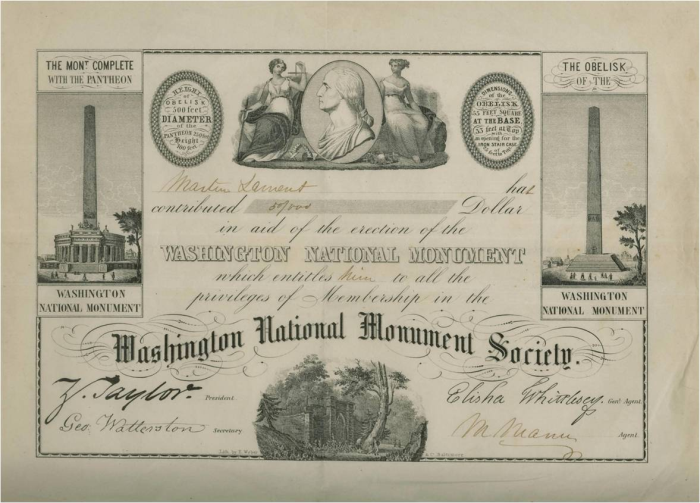 A certificate from the Washington National Monument Society for Martin Lament. He owned the Lexington Hotel in Green County, New York, gave 50 cents for the project, and received this certificate. This image is courtesy of ancestry.com. The winning design was submitted by architect Robert Mills. 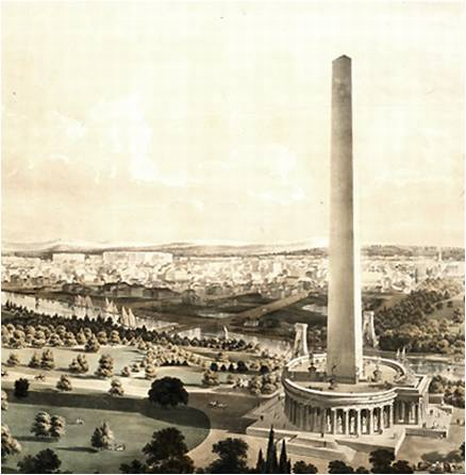 A sketch of the proposed Washington Monument by architect Robert Mills circa 1836. This image is courtesy of Wikimedia Commons. 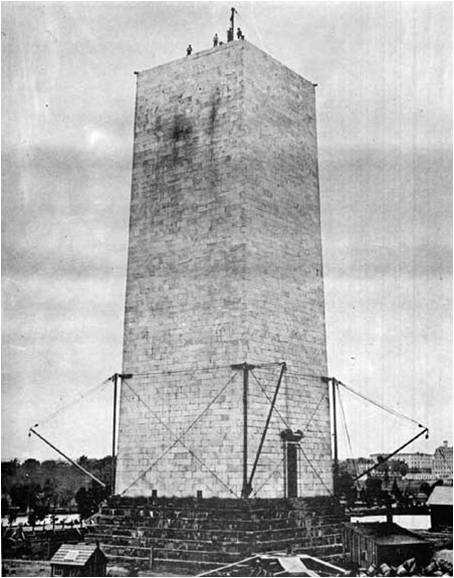 The Mills design of the Washington Monument. 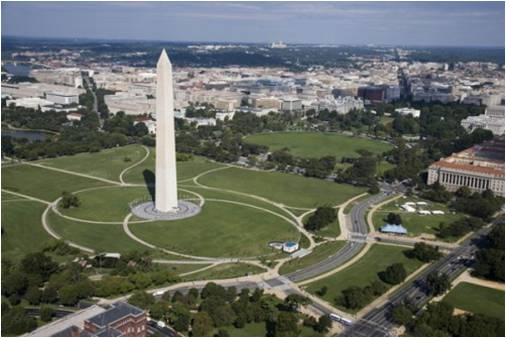 Until the 1840s, the Mall area had been used primarily for grazing and agriculture. A colonnade is a long sequence of columns joined together by a superstructure of moldings and bands which lie horizontally above the columns and resting on their capitals. This image is courtesy of the National Capital Planning Commission. …and a separate statue of George Washington in a Roman toga driving a chariot. 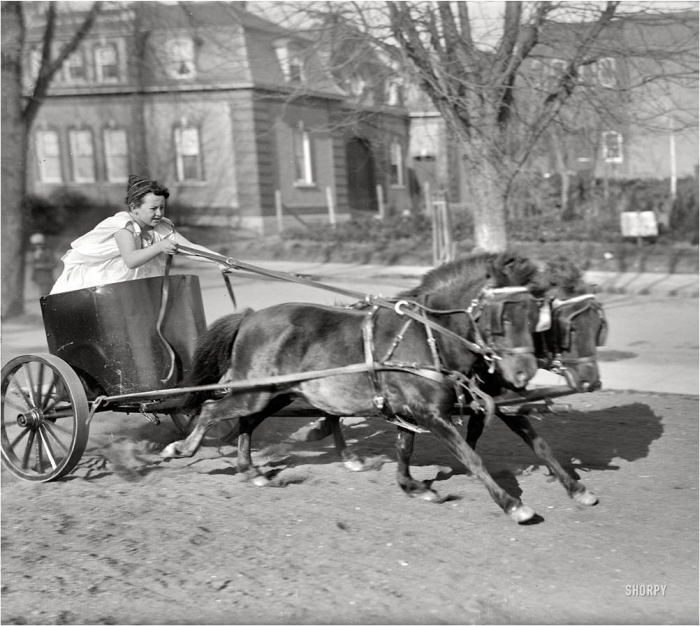 “Devereaux Child in a Chariot” depicts a youngster driving a chariot through the streets of Washington, D.C. in 1917. This image is courtesy of shorpy.com. 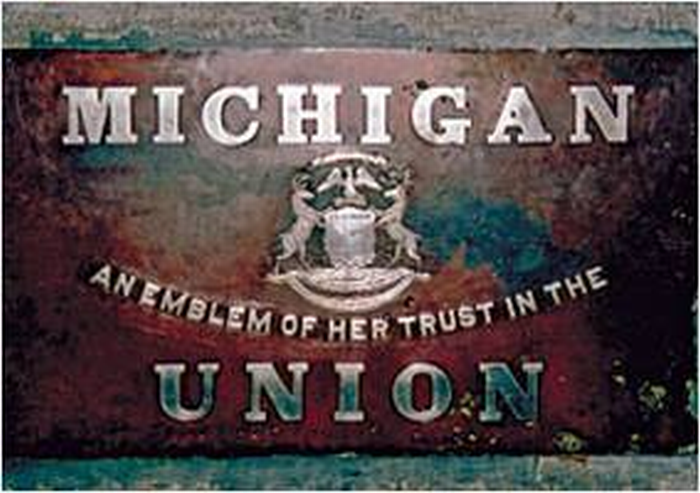 The Mills’ design, which was almost flat on the top, cost over $1 million to construct, and by 1848 the Society had only raised $87,000. Another view of Robert Mills’ design of the Washington Monument. This image is courtesy of the National Park Service. 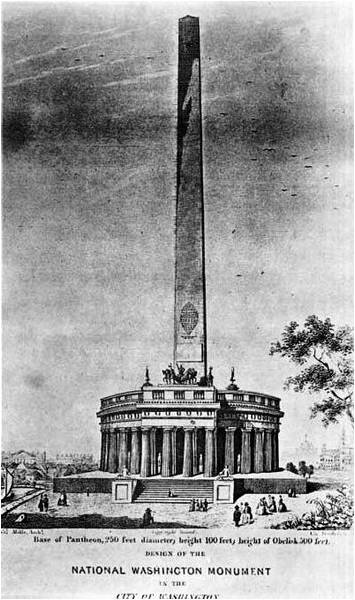 The Society began construction of the monument without the colonnade. 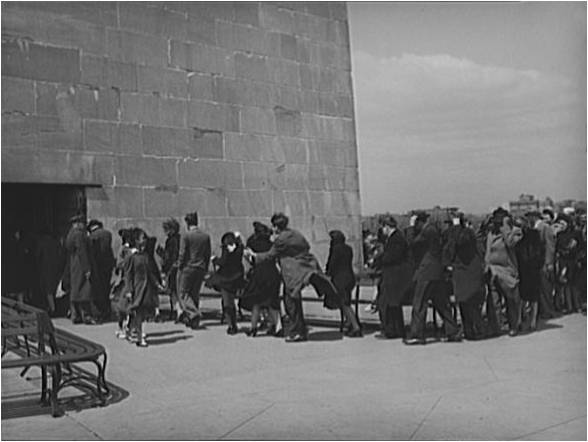 They believed that the appearance of the monument being constructed would spur more donations to complete the project. 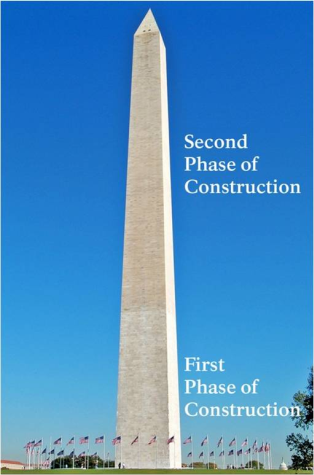 This image probably shows the time period when construction began by the U.S. Army Corps of Engineers to complete the Washington Monument. 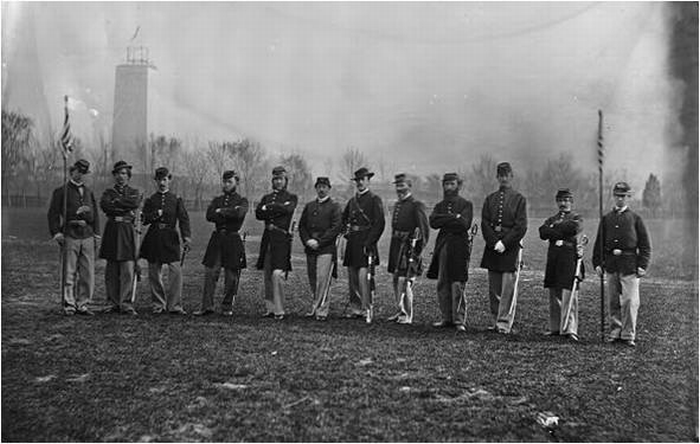 The Corps completed it in December, 1884. The image is courtesy of the Library of Congress. The ceremony to lay the cornerstone of the monument occurred on July 4, 1848. President James K. Polk was in attendance. New York City also attempted to erect a Washington Monument during this time period. 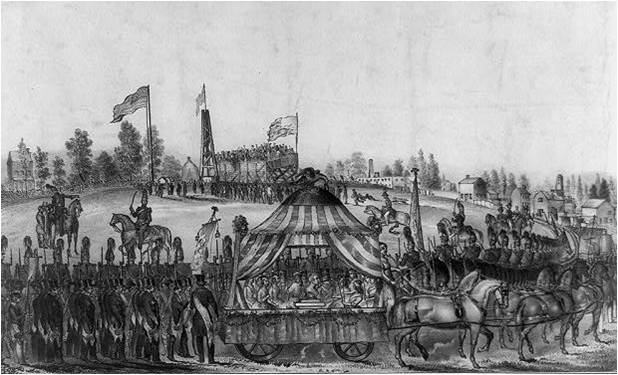 Here is “The Grand Washington Monument Procession” as it appeared on Hamilton Square during the ceremony of the laying of the cornerstone on October 19, 1847, the 66th anniversary of the British surrender at Yorktown, Virginia. The image by James S. Baillie is courtesy of the Library of Congress. Construction continued until 1854 when the Society ran out of money for the project. It was left unfinished in the center of our nation’s capital. This image of the Washington Monument may have been taken circa 1860. The description at the Library of Congress is “Washington Monument as it stood for 25 years.” The image by Mathew Brady (1823-1896) is courtesy of the Library of Congress. Congress voted $200,000 towards the project and members of the Society decided to accept donations of stones from around the country to aid in the completion of the monument. 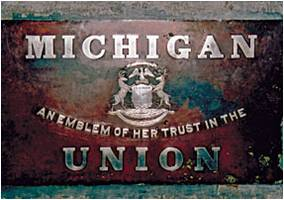 The Washington Monument stone dedicated by the State of Michigan is composed of 2180 pounds of Michigan copper and silver. The image is courtesy of the National Park Service. The memorial stones were placed on the inside of the monument so that visitors walking to the top could view them on their way up the stairs. The interior of the Washington Monument. The memorial stones are on the right. At this level the photographer is approximately 130’ above the ground. The image is courtesy of the Library of Congress. However, only 193 stones were donated of the approximately 36,000 needed, and construction slowed on the monument. 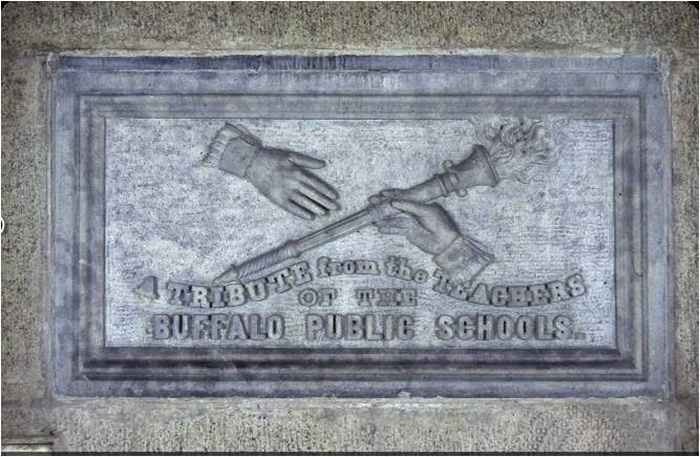 A stone donated to the Washington Monument by the teachers of the Buffalo, New York Public School system. This image is courtesy of longislandwins.com. 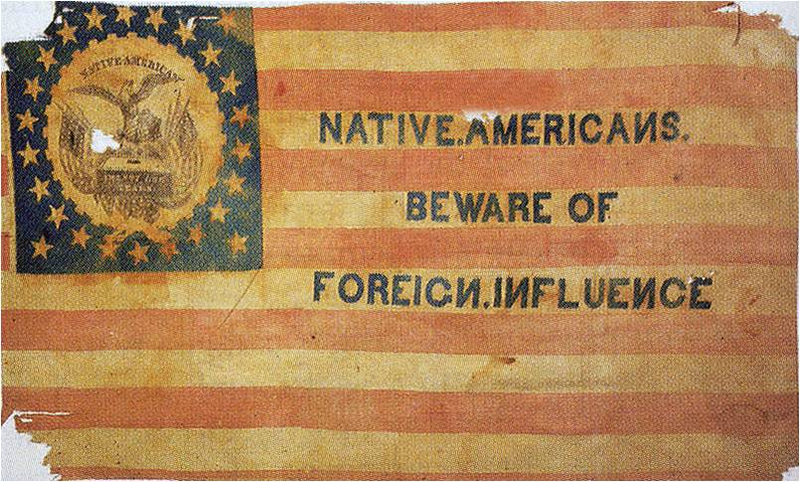 The Know Nothing Party or American Party was at first a secret society made up of Protestant males of British descent. When members were asked about their activities, they were supposed to reply, “I know nothing.” This image is courtesy of Wikimedia Commons. …and threw it into the Potomac River. The Know Nothings then took over the Society’s membership, and Congress withdrew its funding for the monument. 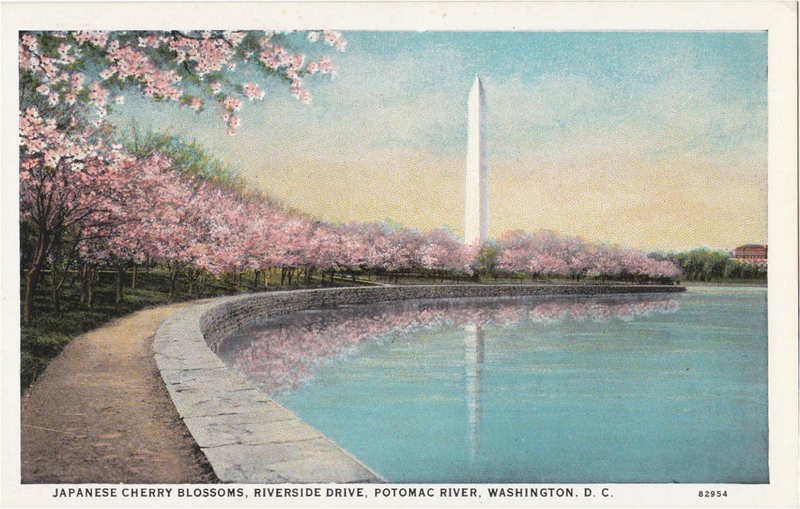 This postcard was created circa 1908 by the B.S. Reynolds Company. It is courtesy of ebay.com. Officers of the United States Treasury Battalion during the American Civil War. The uncompleted Washington Monument is in the left background. 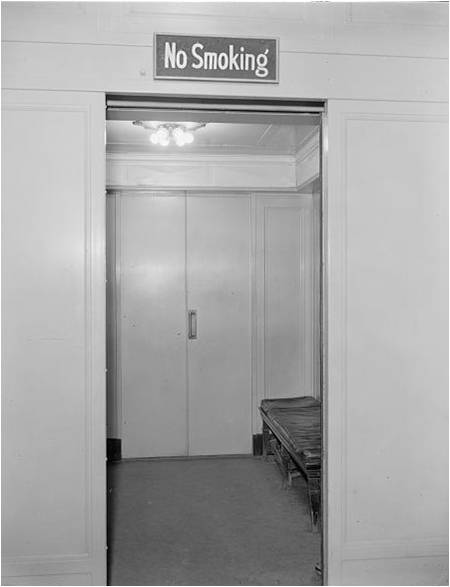 This image is courtesy of the Library of Congress. 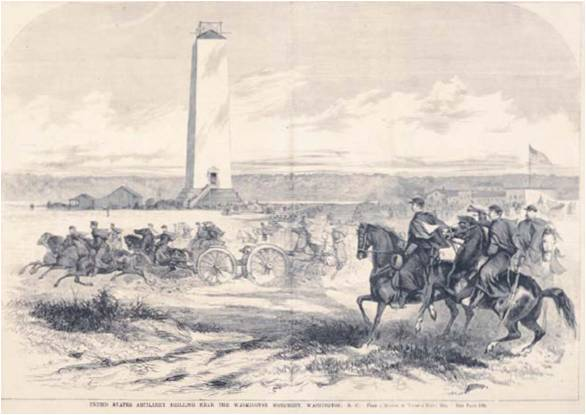 Harper’s Weekly Illustrated magazine shows Union artillery drilling on what is now the National Mall near the Washington Monument. This image is courtesy of civilwarwashingtondc.blogspot.wordpress.com. …cattle were allowed to graze around the monument. A slaughterhouse was setup next to the monument to provide beef for the soldiers. 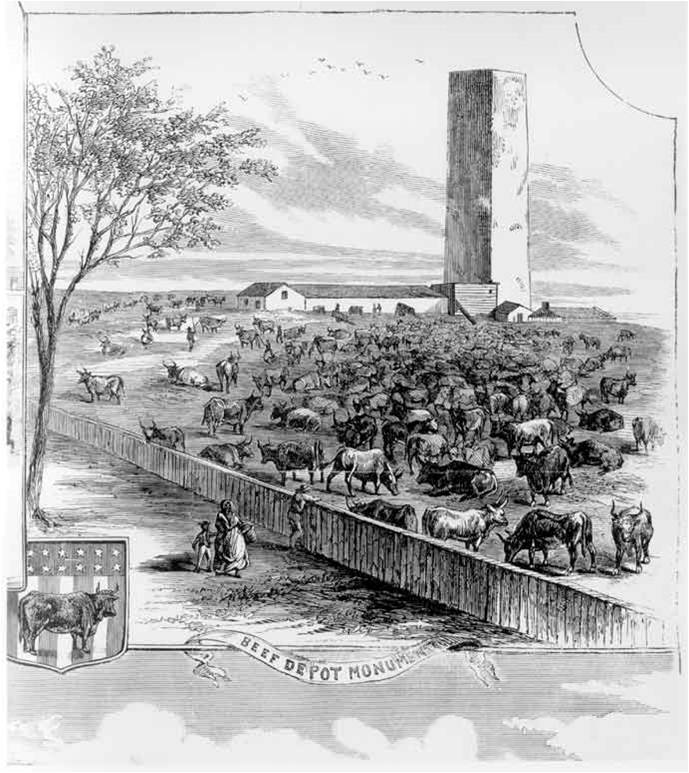 Frank Leslie’s Illustrated Newspaper for February 1, 1862 labeled the Washington Monument the “Beef Depot Monument.” This image is courtesy of the Library of Congress. 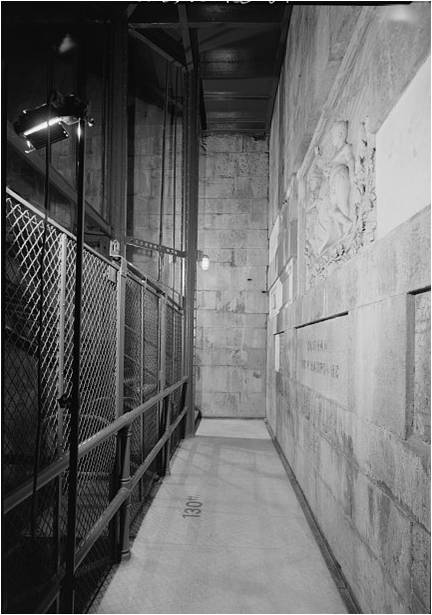 When the cool, stone interior wasn’t being used to store the freshly slaughtered meat, the public was allowed to go to the top of the unfinished structure. The Civil War slaughterhouse was in wooden buildings next to the monument, and the meat was hung inside the monument. This image, taken circa the 1880s, is courtesy of the Library of Congress. Even at one third of its proposed height it was the tallest building in America and a tourist attraction because of its elevation. 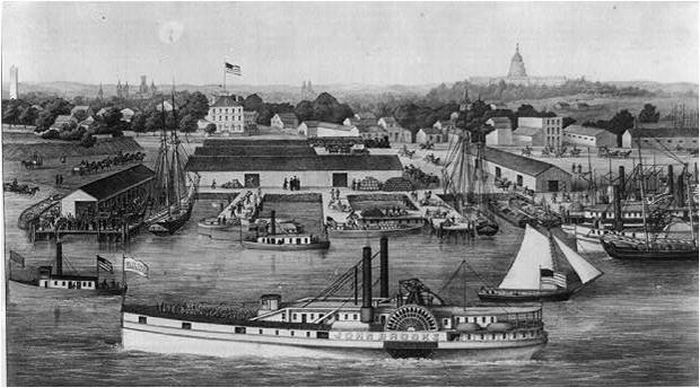 A view of the Sixth Street Wharf along the Potomac River. The United States Capitol is in the right background. 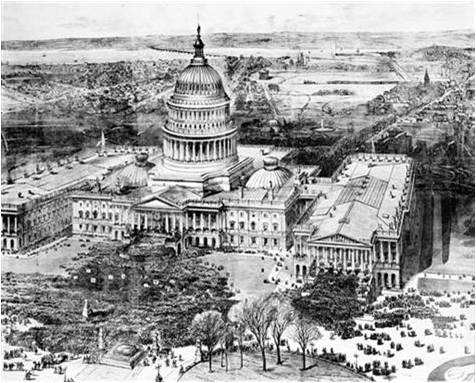 The dome on the Capitol was not yet finished when this image was created. The Washington Monument is in the left background. This image was published by Charles Mangus, of New York City in 1863. This image is courtesy of the Library of Congress. In 1876, on the Centennial of the Declaration of Independence, Congress appropriated another $200,000 to complete the monument. An artist’s view of the inauguration of President Rutherford B. Hayes in 1877. The unfinished Washington Monument is in the background to the right of the Capitol dome. This image is courtesy of msnbc.com. 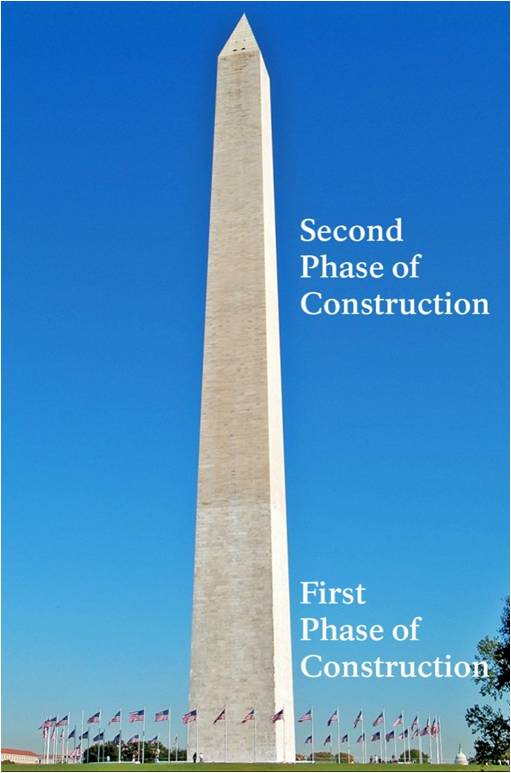 The new members of the Washington Monument Society decided to abandon the colonnade idea, and to have its design look like a classic Egyptian obelisk, including a pointed top. 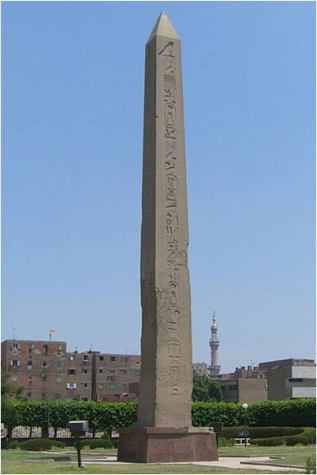 The Obelisk of Pharaoh Senusret I in Heliopolis, Cairo, Egypt. This image was taken by on May 23, 2011 and is courtesy of Wikimedia Commons. Construction on the monument resumed in 1879 under the direction of the U.S. Army Corps of Engineers. A stereoview of the unfinished Washington Monument. 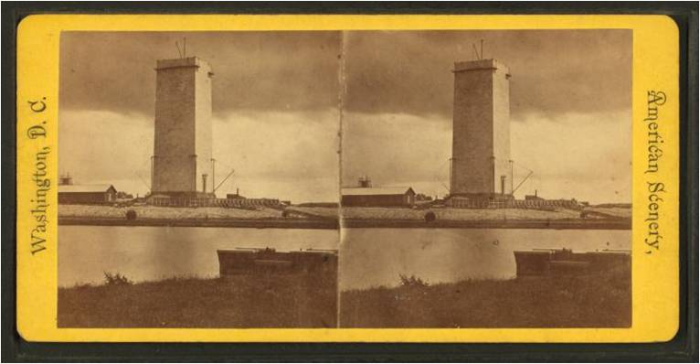 Looking at this image through a stereo viewer gives the viewer a “3-D effect.” This image is from the Stephen A. Schwarzman Building/Photography Collection at the New York Public Library. It is courtesy of Wikimedia Commons. The Army Corps of Engineers quickly worked on the monument from 1880-1884. The unfinished shaft of the Washington Monument between 1880-1884. This image is courtesy of the Library of Congress. A problem that the Corps had was that the color of the stones they were using did not match the color of the previous stones. The stones from the first phase of construction were from a different quarry than the stones used in the second phase of construction. Other sources state that it was the same quarry, but at a different level in the quarry. Although their color appeared to be almost identical when constructed, time, wind, rain, and erosion have caused the marble section to weather differently. This image is courtesy of the National Park Service. 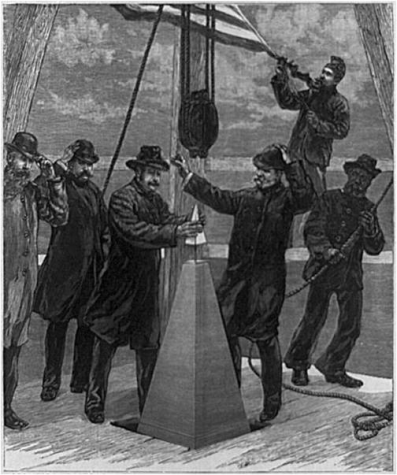 On December 6, 1884 a 100 ounce aluminum apex/lightning rod was placed on the top of the monument. 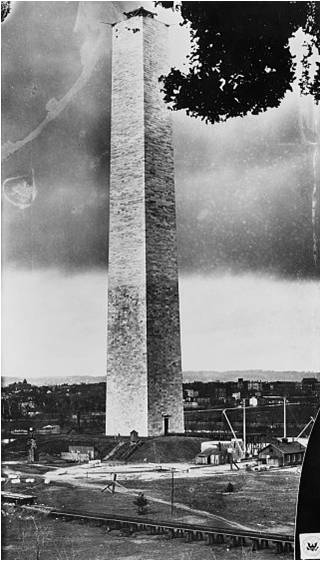 The superintendent of the Washington Monument construction project, P.H. McLaughlin, placed the capstone on the monument. This illustration from Harpers Weekly is courtesy of Wikimedia Commons. The Washington Monument was dedicated by President Chester Arthur on February 21, 1885 (the day before Washington’s birthday). Only 800 people showed up on that wintry day. 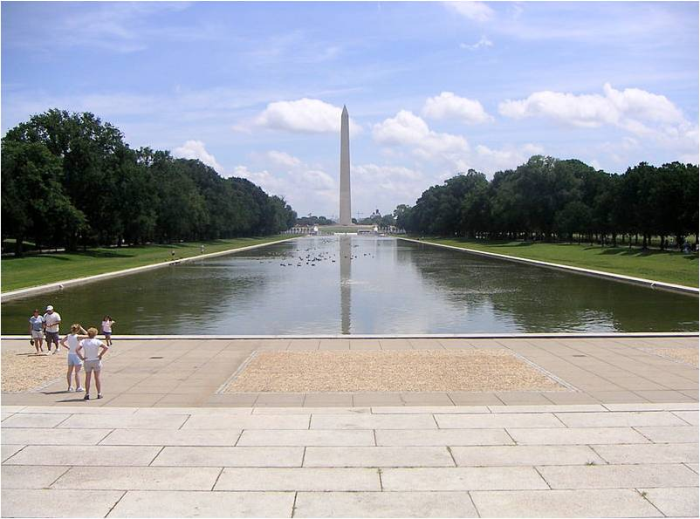 The sparse crowd at the dedication of the Washington Monument. This image is courtesy of the Library of Congress. 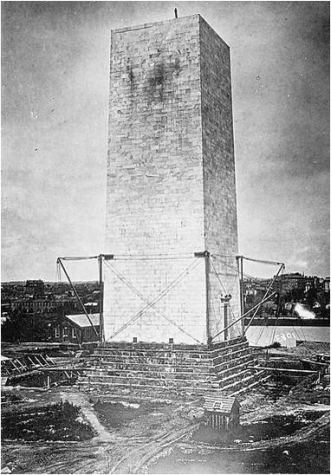 Because the Corps of engineers still had to install a permanent interior stairway and an elevator, the monument would not open to the public until 1888. The Washington Monument elevator circa 1938. This image is courtesy of the Library of Congress. 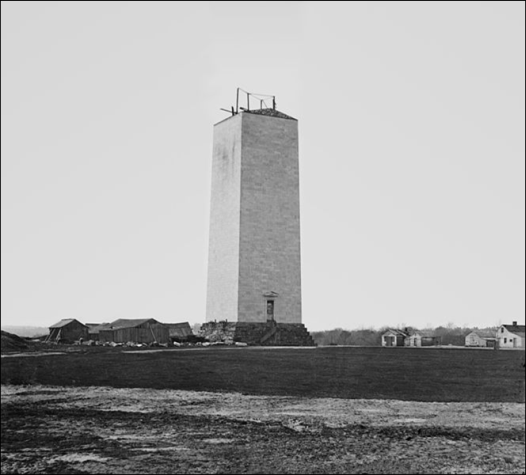 At the time of its completion in 1884, the 555 feet tall Washington Monument was the tallest building in the world. The Eiffel Tower surpassed it in height when it was dedicated in 1889 at 986 feet. An 1884 diagram of the principal high buildings of the world. 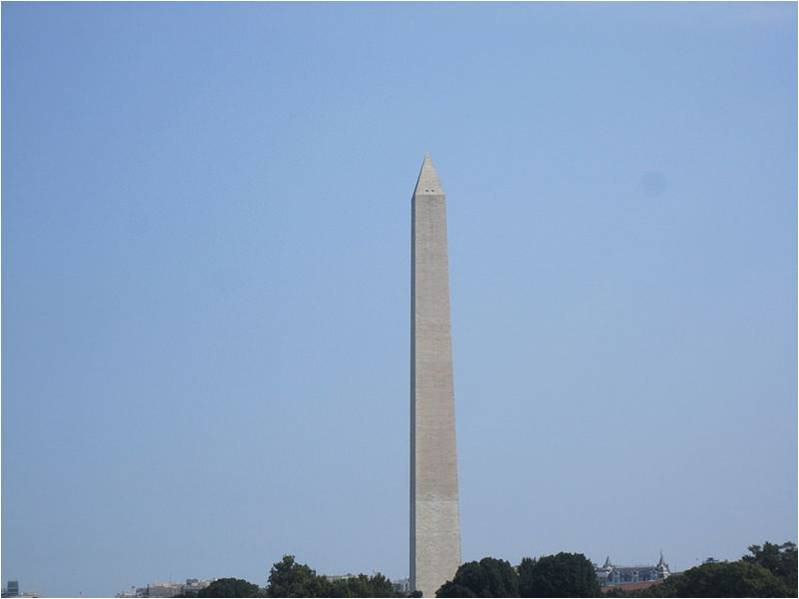 The Washington Monument in the center background surpasses all of them in height. 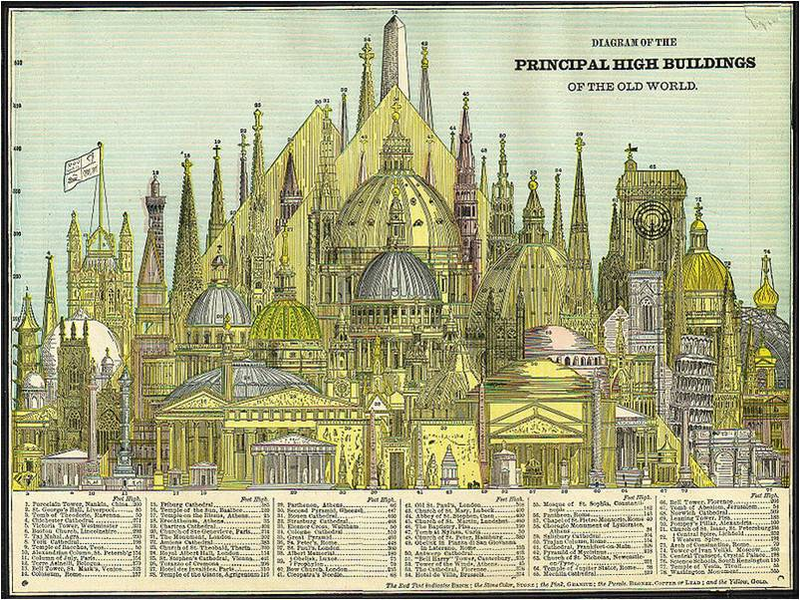 This colored lithograph is from Cram’s Unrivaled Family Atlas of the World and Wikimedia Commons. 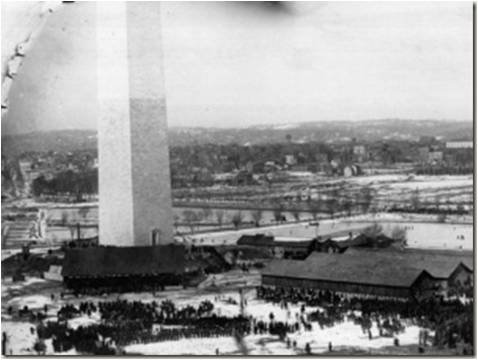 When it opened to the public, the Washington Monument immediately became a popular tourist attraction. Visitors waiting in line to take the elevator to the top of the Washington Monument on a windy day in 1942. This image is courtesy of the Library of Congress. When it is open approximately 800,000 visitors take the elevator to the top for the best views of the Washington, D.C. area. The view from the top of the Washington Monument looking west towards the World War II Memorial, the Lincoln Memorial, the Potomac River, and Arlington, Virginia. This photograph by Carol M. Highsmith was taken on April 30, 2007. It is courtesy of the Library of Congress. At a height of 555 feet, 5 1/8 inches, it is the tallest “free standing” stone structure in the world. Taller monumental columns exist, but they are not all stone. 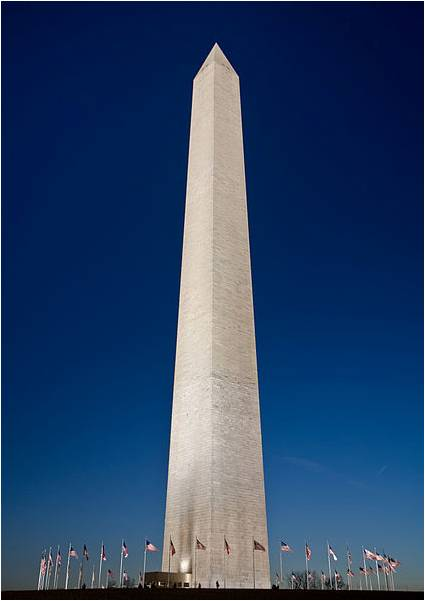 The only steel in the Washington Monument supports the elevator shaft. This September 26, 2003 image by the United States Navy is courtesy of Wikimedia Commons. It is the tallest obelisk in the world. Other obelisk-like structures may be taller, but they are not considered by most architects to be true obelisks. This image taken by Billy Hathorn on July 31, 2011 is courtesy of Wikimedia Commons. It is the tallest structure in Washington, D.C. The base of the Washington Monument, which is 55 feet wide, is holding up approximately 80,000 tons, or 16 million pounds of granite and marble. This image by Carol Highsmith is courtesy of the National Park Service. 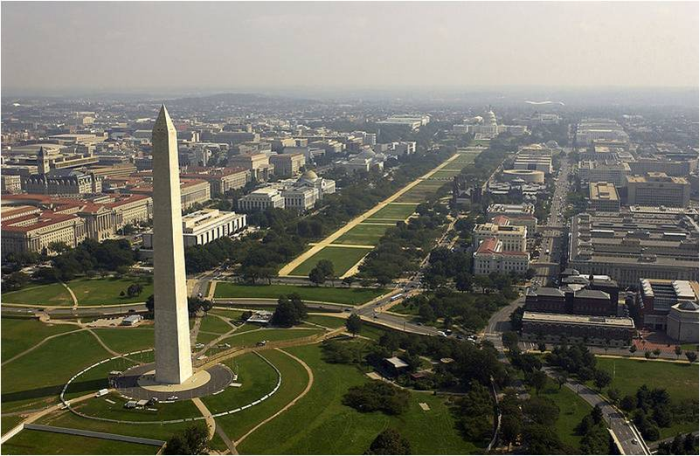 The Washington Monument is currently closed due to an earthquake on August 23, 2011 which damaged the monument. 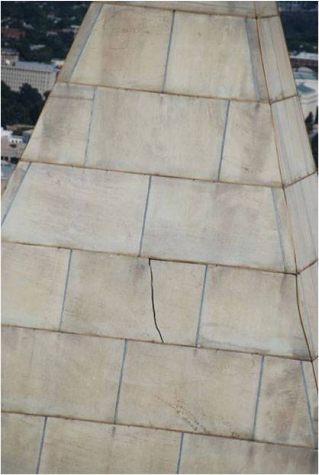 Exterior cracks in the Washington Monument due to the magnitude 5.8 earthquake. This image is courtesy of the National Park Service. For the present we will have to admire it from a distance. The photographer is standing near the base of the Lincoln Memorial and is looking across the Reflecting Pool towards the Washington Monument. This image taken on July 31, 2005 is courtesy of Wikimedia Commons. George Washington, standing near the flags on the right, was the President of the Constitutional Convention in 1787. This painting by Howard Chandler Christy (1873-1952) was completed in 1940. It is courtesy of the Architect of the Capitol and Wikimedia Commons.